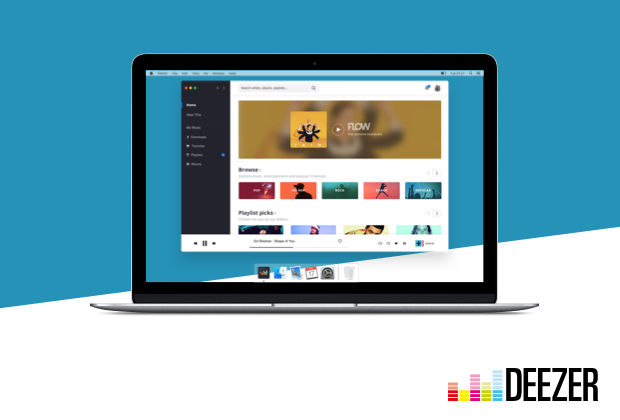 Music streaming service Deezer released a desktop macOS app on Wednesday that offers high-definition lossless audio playback in the popular FLAC format. The app not only eliminates the hassle and additional step of opening up a new browser but desktop users with Premium+ account, who download the new app before January 2018, will be able to hear all their music in high-definition audio by selecting this option under sound settings. The desktop Deezer app is currently still a beta, but it does include access to 43 million tracks as well as a working version of the Flow feature, which is similar to Apple Music's personalized playlists. Flow recommends songs based on previously played tracks, as well as video interviews and performances. Deezer subscribers can download the desktop app using this link. Deezer uses MP3 for their standard plan. Yuck. MP3 needs to die already. I never use MP3 for anything. It is either aac or lossless. I had the misfortune of having to give up Tidal HiFi for Apple Music recently. Tidal is terrible. They have the least amount of music and they push their rap garbage over any other types of music. You can search for anything and they push rap over other results. My unused trial ends next year. CD quality, not high definition. I had the misfortune of having to give up Tidal HiFi for Apple Music recently. Apple Music sounds crap. I would never voluntarily pay for Apple Music, I got it free for a year with my phone plan, probably because Apple wanted to get the numbers up. Other services are going to start offering higher than 16/44 CD quality soon if they haven’t already. Apple needs to lift their game. In a world where you can shoot 4K video on your phone and 8K televisions will soon be a thing it’s crazy that digital music retailers like Apple still haven’t matched a 30 year-old audio standard. While I still listen to all of my FLAC & Lossless music locally, I'm really happy to see a MacOS application for this. When every day it's all about streaming low bit-rate crap to tiny phones w/o a headphone jack, it's really refreshing to see an application or Mac. I want to subscribe just to support efforts like this. This is just marketing crap. Nobody has ever been able to hear the difference between a 256kbps AAC audio file (like Apple Music is) and a 24bit WAV file. EVER. All the people that say they hear a difference didn't take a double blind test yet OR are so so afraid to show their test results online – I wonder why. I've taken a double blind test several times and was never able to reliably tell the difference. By the way: I'm an audio engineer whose ears should be trained to do that. I can't. And all people who say they can are LIARS. They do biased tests by switching back and forth with them knowing which file is what. Of course your brain will tell you that WAV sounds better. But as soon as you don't know which is which you'll fail. I believe you’re the one who is mistaken. You’re pushing tired old arguments that are increasingly being debunked with newer evidence to the contrary. In fact many of those studies you’re relying on were poorly described and relied upon listeners with no training or concern for high quality audio. I.e. the average joe where near enough is good enough. There’s a meta analysis of many studies which shows a positive identification at a statistically significant level for listeners who were trained to recognise high-res audio and knew what they were listening for (I’m a data analyst with a science degree so I know about stats). Furthermore, the analysis highlighted some studies that had fairly high rates of positive identification and in particular some individuals who have a much better ability than others. This could be due to many factors such as genetics, experience and lack of hearing damage. I’ll try to find it and post back. So just because you can’t tell doesn’t mean everyone else are LIARS. As for Apple’s lossy AAC, I suspect it was converted from 16/44 lossless CD, which itself was created from higher resolution sources, making it sound worse than it otherwise should. This is why Apple began marketing their “Maatered for iTunes” albums. They’re probably much better because greater care was taken during the mastering process and conversion to 256 kbps was done in one go from the master. I pity you if you can’t tell. Maybe you have damaged hearing or you just aren’t suited to your career. Unfortunately, many young people are damaging their hearing these days because of prolonged use of poor quality headphones of which which Apple’s bundled EarPods are amongst the worst. Yeah, for their own data-costs, you'd think they'd want to do AAC just to save money in overhead. MP3 is not as efficient for the same sound quality as AAC. Are there any codecs here or on the horizon that challenge AAC? True their library is lacking compared with Apple’s but I still find plenty of what I like. The app itself is miles better than Apple’s Music, which pushes their own services and has an ugly, fat, white UI. I ignore the featured/pushed music on both platforms and just use search, then check out other artists that are similar to the ones I like. Apple may not push rap, but the bland pop they feature is equally bad if not worse most of the time. Remember the U2 debacle? I actually like some French rap and pop which is quite different from English music (i.e. better) and Tidal is good there. I’ve even seen a few albums I like that Tidal has but Apple Music lacks. Also, Tidal lets you watch full videoclips, which I don’t believe Apple Music does. In the end, I’ll take Tidal’s smaller library but higher quality and better app any day over Apple Music. I tried Tidal for a month and felt like they really go out of their way to target a black-only audience, so I left after the free trial. You contradict yourself, you say you need to be trained to hear a difference, yet you say he can't tell a difference because he might have "damaged hearing". First of all, if you need to be "trained" to hear a difference it really isn't worth it to increase the file size of a track for mainstream consumption, also, I assume you are one of those insecure audiofools that buy snake oil and actually believe they can hear a difference, yet they offer ZERO PROOF. I am not against Apple offering lossless or even hi res downloads / streaming, but with improved mastering and less compression. A poorly mastered track will still be horrible at 24/96. A great master will sound great, even as a 256k AAC file. Sorry, but I rather trust music engineers and people that actually create the music, over an "expert audiophile". "Because i can't hear a difference, no one can hear a difference"
lol. Lets try a few more. "Because I can't see it, no one can see it"
"Because I can't smell it, no one can smell it"
"Because I don't believe it, no one can believe it"